This week, we’re taking a look at the Guild Guides! Q. What are the Guild Guilds? Q. Are they for gamers, or can anyone enjoy them? Q. That wasn’t a “yes or no” question. Q. So, is it for gamers or not? A. The books contain useful, system agnostic references for fantasy gamers; for example, a bard wanting to execute a Cutting Remark will find three convenient d20 charts for classic insults. Likewise, a gamer designing a cleric might enjoy our guide to blunt weapons, and the rogue’s book will contain a number of popular scams to run during your games. These are great for players running that specific class, or for GMs. However, our goal is to make content that is entertaining to everyone: current gamers, gamers who are between campaign, and even people who’ve never played a roleplaying game. They’re kind of like “coffee table” books. Q. Who wrote the books? A. Each book is “written” by one of the characters in the Tangent Artist’s comic CRIT! (don’t worry, they’re still funny even if you don’t read the comics… though you should). Miles Rayner wrote the Bard Book himself, and is proud to let everyone know it. Morfindel the cleric is not the most verbose of characters, so he borrows a lot from his old textbooks, complete with his notes scribbled in the margins. Bart also steals heavily from a local watchman manual for the rogue book (which seems appropriate), although his comments in the margins are a lot less polite. Q. What’s in the Bard Book and the Cleric’s Guide? A. The bard’s book has such wonderful resources as: “an Elf, a Dwarf, and a Halfling walk into a Bar” jokes, simple rhymes for faking songs, and how to insult the Unfriendly (and Friendly) races of the fantasy world. The cleric’s book includes: evil sigil bingo, fill-in-the-blank eulogies, and a guide to religious holidays (which you can use to get off work). Q. What can we expect in the new Rogue’s Book? A. By the end of the year, we hope to have digital versions of the three books available for eReaders- watch this spot for updates on when and where you’ll be able to download them. If that weren’t enough, we’ve already started work on the Ranger’s book. 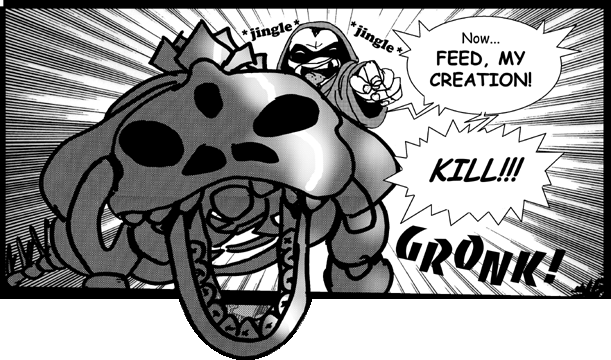 The ranger book will be “written” by the CRIT’S cranky lead, Linus Weedwacker; expect it sometime in 2016-2017! We already have a few ideas on what will come after that, but we’d love to hear your suggestions. Warriors? Wizards? You decide! Art by Tazio Bettin & Enrica Eren Angiolini. Image owned by Evil Hat LLC, used without permission. In all of the excitement, I haven’t had much time to write content this game blog. However, I’ve struck upon a great idea: I’ll share with the interwebs some of the bonus Umdaar material that didn’t make the final cut. 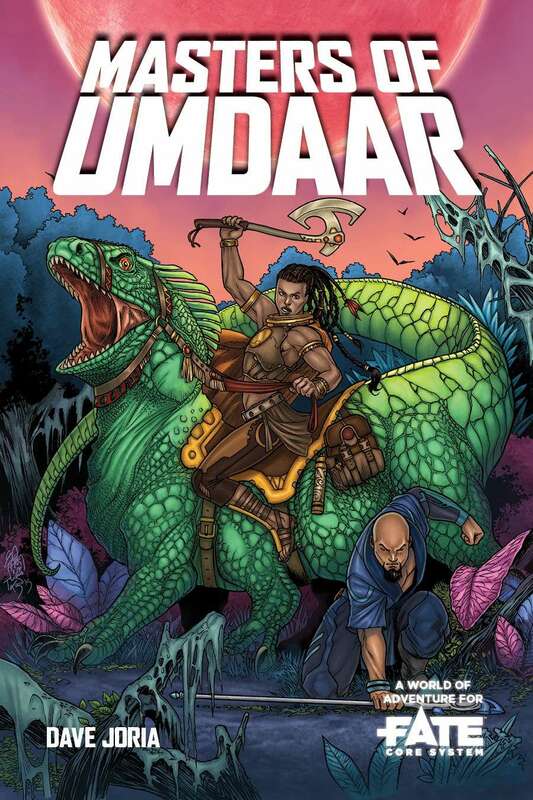 In the early drafts, one goal for “Umdaar” was to have an instant Unplanned Adventure. Players could spend 5 minutes on character creation, and the GM, with a slew of randomly generated names and monsters, could create a setting in less than 15 minutes. (An ambitious dream, I know.) However, it was decided to include more pre-made material (like the “Starblades of Su’ul” adventure), and to par down the GM material a bit. Thus, it’s no surprise that the bonus content is entirely tables. A generator for creating random PC or NPC names. Foll 4dF twice, once for the prefix (top half), and once for the suffix (bottom half). Use the Title Generator below to create the Master’s title. Alternatively, you can use the Name Creator from the character section, or put the two together—ex. NagTaal the Lifetaker. Foll 4dF twice, once for the prefix (top half), and once for the suffix (bottom half). On the chart above, it is possible to end up with titles like “Hopelord.” You can reroll, but we suggest you go with it- no doubt the Master is a charismatic leader, who is worshiped by his oppressed subjects as a demigod! In the first few drafts, “Umdaar” was more about the geography- the artifacts were more of a by-product of exploring, rather than the motivation. Thus, there were also random tables for creating wild biomes, AKA the Wildlands (although they work for Dark Domains as well); likewise, there was also generators for Midway points, and for buried structures or evil lairs waiting for them- this was called the Final Destination. Going through a Wildland without any incident is boring. Thus, we had a Midway generator; they are intentionally generic, so they could be dressed up to match any location. Some of them provide obstacles, while others provide “window dressing” for a character conflict (rather than having a scene take place in a vacuum). – The Crossroads – Where two paths intersect. A place of detours, losing your way, and highwaymen. The Fortification – A man-made barricade, a roadblock, or proper fort. You must deal with the defenders, or physically overcome it. The High Ground – Before you is higher ground, granting anyone on it a tactical advantage. Alternates: Dunes, Barrow Mounds. 0 The Ruins – A cluttered area, rife with hiding places, forgotten artifacts, and sleeping dangers. The Fertile Ground- A blooming place in a hostile land, and an ironic place to be threatened. I.e. oasis, watering hole, mushroom grove, hot spring. The Shelter – A small shelter stands, bowing under the weight of the elements. Perhaps a resilient occupant still resides there. I.e. A camp, covered wagon, shack, hovel. + The Pass – Before you lies a natural path or bridge that must be traversed if you are to proceed. I.e. across a gorge, river, through a reef, a mountain pass. The Fog – An area where the senses are dulled, and teams can easily become separated. I.e. a dark bog, a misty rainforest, a sandstorm, a smoky lava field. The Obstruction – A terrain feature that cannot simply be walked around it- takes active effort to overcome. I.e. swimming a lake, scaling a cliff-face, climbing the massive trees. The last worthy bit of content cut from Umdaar was the Adventure Generator, but that is long enough that it warrants a blog post of its own. Until then, readers, game on! You’ll jump! You’ll swoon! You’ll demand to see the manager! week, we’re going to give you a full adventure to run. This one was inspired by the first Skeleton Crew comic we ever wrote (if you’re a player, no peeking, as there are spoilers!) I’ve used it at many conventions, it can generally be run in a little over 2 hours. Enjoy! This is a Skeleton Crew RPG pickup game, designed for 2-6 players. The PCs start with 20 points of skill, with a cap of Great (+4). While some of the skills and aspects are provided for the players, Fate is a very much a “make it your own” kind of game, so we have left some parts blank. For filling in aspects, the GM will start the game by asking a few questions, to see about the character motivations and connections. Any open skills or aspects can be filled out before the game, after it starts, or even near the end. GMs are encouraged to let players switch out skills, even mid-game, and not to worry too much about the retroactive changes. Reminder: if they decide to gain more Physique or Will, it will give them extra Physical Stress or Mental Stress. Keep this in mind. Read aloud: You’re New Manchester’s premier team of Monster Hunters and paranormal investigators. You have tangled with plenty of underworld criminals, and have made many enemies, but you’ve also recruited a handful of allies. One of them, known as the Nosy Shadow, just heard that the necromancer Deadringer is hitting the Schmitzonian Museum of Natural History tonight. You head there as fast as you can, hoping you can beat him there. As the crewmates pull in closer, they see the skinny Deadringer at a broken window, slipping himself through. He sees you coming up, curses to himself, “Oh, fudge me!” and climbs through awkwardly. For a list of pre-made PCs, see last week’s blog post. If you want to reverse the gender of any of them, go ahead- Shelley can easily become “Sheldon” or “Percy”. It’s your game! The GM should ask the players the following questions- these will help shape their aspects and relationships for the upcoming game. If the same player tries to answer more than one or two, make sure you allow other players a chance to answer some. Former Enemy – You (Character A) find yourself on a team with a former enemy (Character B.) Write your feelings towards this character. Do you trust ‘em? Character B: do you mistrust A back? Is there an ulterior motive behind your cooperation? Superiority Complex – You (Character A) consider character B to be your biggest rival- according to you, B thinks he’s SOOO much better than you, and you’ll do anything to prove that you’re the best. Character B: Is A your rival too? Do you feel like A is better than you, and you likewise have to prove your worth? Do you actually feel superior, but don’t feel the need to prove it? Love in the Air– You (Character A) are head over heels in love with character B. Character B: write an aspect showing your acceptance of this love, or your knowledge / lack of knowledge about it. Ulterior Motive – You (Character A) secretly or overtly want something that only Character B can give. Does B know information about a secret treasure? Does B have an ancient artifact that you’re eager to pull from their dead fingers? Character B: Do you know of A’s objective, or do you only have vague hints? Love Gone Sour – You (Character A) used to be in a romantic relationship with Character B, before it crumbled; OR, Character A had a relationship that was disrupted, thanks to Character B. Write your an aspect reflecting your interpretation of the events. The following section contains spoilers of what’s ahead, and should be viewed by the GM Only – players, back off! 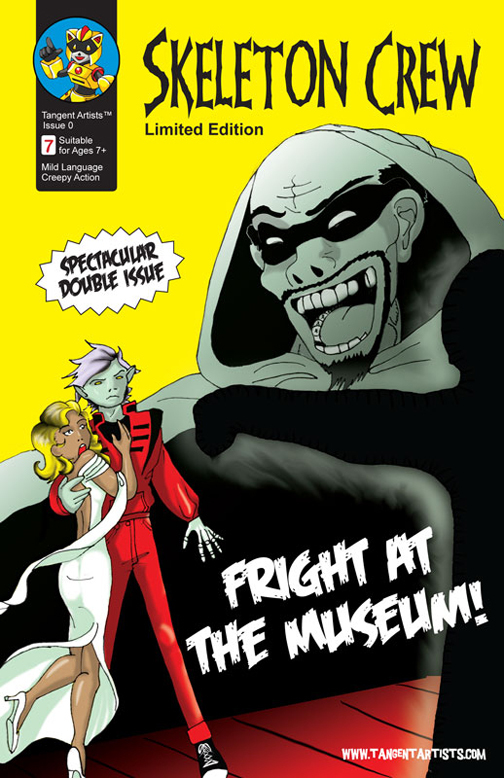 Act 1 – The Foyer / Vampanzees Attack! Act 2 – The Hall of Sharp Pointy Objects / The Orb of Kao! Act 4 – The Dinosaur Exhibit / Rex Awakens! OOC: Players are to become accustomed to rpgs (turns, skills, declaring actions,) and Fate system (combat, aspects, stunt & invokes). If possible, also introduce compels and consequences. Players should enter the building after Deadringer- common ways include climbing in through the window (athletics) or breaking down the solid door (physique). The first room is the main hall of the museum. Once you get in, you see Deadringer at the other end of the hall, about to slip into the first exhibit. Deadringer pulls back his cloak an reveals a cluster (hardly an army), of vampanzees- namely, vampire chimps, complete with tiny fangs and short black capes. At this point, players should brainstorm what the main hall is like. I recommend a large Woolly Mammoth model in the center of the room. Other ideas could include a gift shop, an info kiosk, fire extinguishers, lighting fixtures, etc. Skills : Fair (+1) rating in Athletics. Stress: No shift boxes— one shift of harm is enough to take them out. Alternatively: Have only 2 vampanzees (which will be weak,) but invoke their aspects a lot- this will demonstrate the players how invoking works. Initiate Combat – Roll for Notice (Reminder: Zomboy & Caomh have stunts that give them order bonuses). Determine the objectives & stakes: Vampanzees, for their part, want to scratch you, drink your blood, and maybe eat a few fingers, until they’d grow bored with your bodies. Phase 0: I recommend you institute Phase 0, especially with a new group. One the first exchange, characters are not allowed to make Attacks- instead, they can only Create Advantages or Overcome. 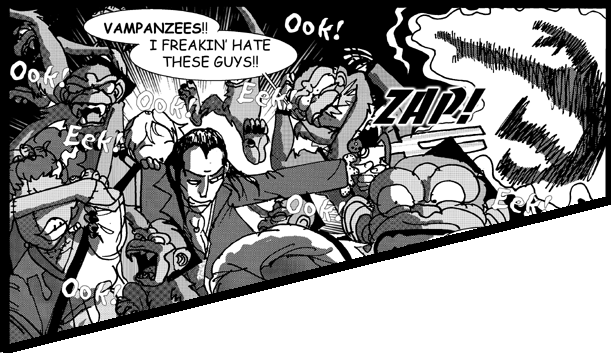 Possible Compels to consider: Vampanzees are very curious. Weston has trouble with Light. Amon-anda might has trouble is the Vamps act in a particularly nasty way. Once the vampanzees are cleared, players can follow Deadringer down the hall. IC: Characters reach the end of the hall, which is best achieved by disabling the Orb of Kao. OOC: Characters have experience with a non-combat obstacle, and test out a Challenge. As you leave the main hall, you get a closer look at the exhibit Deadringer escaped through: “The Hall of Sharp Pointy Objects.” It seems a poorly thought out exhibit, with display items ranging from historical, like ancestral knives and spears, to mundane and random, like bent pipes and jagged rocks. Really, someone should be fired for this. At the end of the hall, you see Deadringer place a large black crystal ball on the floor. He rushes out the door, and the orb starts emitting a thick smoke. The smoke seems to coalesce into spectral hands, which start reaching out and feeling the objects around them. There is also a high-pitched melody emitting from the orb, like the lullaby from a music box. Any attempts to approach the orb will result in the hands grabbing random sharp objects and throwing them in the character’s direction. I recommend one free “jump back” into the safety of the doorway, giving the characters time to plan their approach. Experts will recognize the sphere as the Orb of Kao, a soul catcher from Ancient Egypt (they’re pretty rare, which makes the fact that Deadringer found one a little surprising.) It protects itself with ghost hands, and plays a haunting melody that hypnotizes anyone close enough to hear it. 3. Crush the Sphere – Recommended Difficulty – 6. Recommended Skills: Physique. Taking Turns: Each challenge should be tackled by one character at a time. 1-3 Characters: You may have one character attempt all three challenges (as they run the gauntlet), or may have characters tag in. You may also consider lowering the difficulty of the later challenges by one or two points. 4+ Characters: We encourage each challenge be tackled by a different character, as they divert one part of the orb’s defenses, letting the next character tag in. If having over 6+ characters, considering raising the difficulty of the lower level challenges by one or two points, or consider adding a fourth challenge. > Make one attempt to use create an advantage to create an aspect. > May use the teamwork rule to add +1 to any skill rolls, provided they are at least Average (+1)in it. Outside the box: If players want to attempt to get the orb some other way, go for it- just write up a 2-4 part challenge for them to overcome. One group used a hypnotized Vampanzee to run the gauntlet, after using illusion powers to convince it that the orb was a banana. Failure: If a character fails to overcome challenge one or two, don’t forget that they can succeed at a cost- this might mean they stumble through a challenge, but have some negative boosts, aspects or consequences to hinder them the next challenge or scene. Victory: If the orb is destroyed or overcome, the characters can safely go to the next room. There is also a “broken orb” aspect which the players can exploit. IC: Players realize that the mummy remains undisturbed, and that Deadringer is casting something in the next hall. OOC: Nothing major. If players want to prep themselves, allow each player a chance to prep once. You run into the exhibit of Amon-Khee-Sunkhel, and find it- strangely quiet. At first glance, it appears that nothing is disturbed. When the players get tired of searching, lead them to the next room. Any magic users may wish to pilfer the exhibit for talismans of mild power. Characters can also steal prop weapons or search for ancient weapons. IC: Defeat or subdue Deadringer and the Skelesaurus. OOC: Players become familiar with Consequences, and fighting a character with multiple stress boxes. Against the T-Rex, players will hopefully see that stacking up Advantages is a good strategy for muscling through its tough hide. You follow the (trail of magic / smell / maniacal giggling) to the next exhibit. It’s marked: “Mesozoic Marvels: In the Time of the Dinosaurs!” As soon as you come in, you can feel the crackle of ozone in the air. In the corners of the room are four mismatched candles, with hastily squiggled chalk circles. In the rear of the chamber, Deadringer has sprayed a chalk circle around the massive Stegosaurus skeleton. Stakes: Deadringer- if he succeeds, he & the dinosaur break into the night to wreak havoc on New Manchester. Once more, ask the players what’s in the room, and Roll for turn order. From the room arise half a dozen velociraptors, each a staggering… two feet tall. The raptors run around the floor, nibbling on everything and getting underfoot. At the moment, they’re directed at you, but given time, they’ll likely get in EVERYONE’S way. The raptors are an Aspect that cause an obstacle when moving from zone to zone (recommend Difficulty 2). Deadringer has a free invoke on the raptors, but any player can invoke it. Once a player has overcome the raptors, they won’t bother that player again for the rest of the scene. Players may also attempt to dispel or whoop the raptors completely (recommend Difficulty 4). Aspects: Massive spiked tail; Don’t make it mad; Vegan at heart. Monster – Skele gains +3 from Invokes instead of +2. Necromaniac: As long as he has his Doombell, Deadringer can create advantages themed on blood, spirits, bones, shadow, or anything else. These summoned forms can be invoked to help him as normal. Slippery Devil – Deadringer gets +2 to Athletics when using Overcome to avoid being pinned down or held.